We all learn everyday if only we keep our minds open. 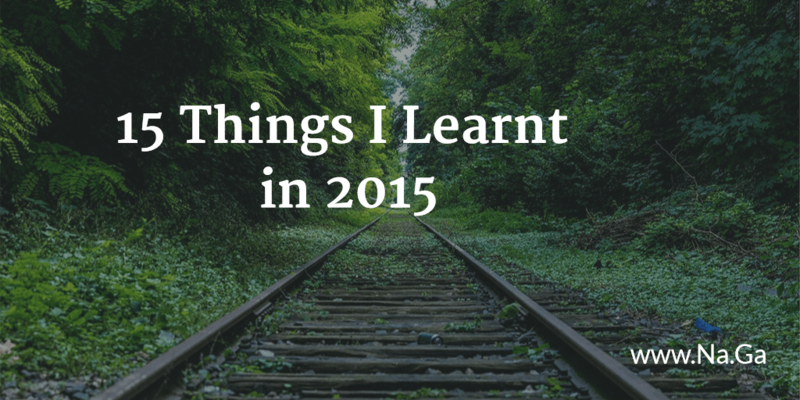 Here is a random list of 15 things which i learnt in 2015. Its actually a collection of learning from 2013 to 2014 to 2015. Earlier i had written on 12 Things I Learnt in 2012. Its 2016 and here are the 15 things i learnt from 2015. Expect more out of yourself. Its the mental ceiling you set for your achievements. You can actually achieve more than you think you will. Connect to people genuinely. If you are able to collaborate that’s great. But having a real meaningful connection is better than just having a network contact. Every action you do is sending out some signal and shaping peoples perception of you. Just being aware of that will help you shape right perceptions by others. If your ideas of ahead of the times you will experience negative force. But if you believe in your idea keep working on it on the ground. When the tide turns you will be so much ahead of others. Be passionate about what you do. If you have passion it shows, it communicates, it converts people’s minds, it makes you more likely to succeed. Be nice to people. It helps you keep your peace of mind. Overtime your harshest critics will become your best supporters. If you want to lead, get your hands dirty first. Be a hands on leader and you will be more effective. If people criticize you, don’t defend. Instead state your point clearly and leave it to them. If your work is remarkable you will have many detractors. But you will have a lot of well wishers too. If you have an idea, its better to do it and show. Its much easier than trying to convince somebody to accept your idea. Give people time to listen to your idea. To assimilate it. To accept it. Then you win a supporter for life. The more time it takes for your idea to be accepted. The higher the impact it will have. Remarkable work takes time to get the appreciation it deserves. Technology is a means to an end. It can help you achieve your goals if used wisely. Find partners across domains and sectors to collaborate. The more the better. You work will be more holistic, impactful and long lasting. If you need permission to innovate, you will never. The very essence of innovation is breaking status quo. Now read Point no. 10. The world is changing faster than you can imagine. Think big. Start small. But keep the big picture and the changing landscape in mind. If you had a great learning recently, share it in the comments. Nagarajan M Copyright © 2019 All Rights Reserved.